Hello, Friends! Welcome to the Dennett Elementary Art Page. 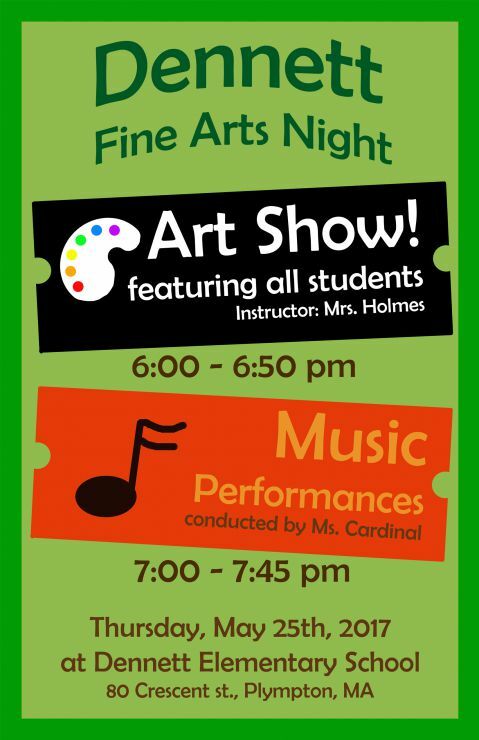 I am the art teacher, Mrs. Holmes. I always tell my students, ‘Everyone can draw, but no one can draw just like you.’ Each individual brings their own style, creativity and perspective to a work of art. Through art, our students have the opportunity for self-expression and have the ability to showcase their personal strengths in a meaningful way. This not only helps them to become more perceptive in art, but also in life. From creative problem solving, to discovery, to investigating, dreaming and inventing, creating art is a great way to improve concentration and express individuality. Below is a sampling of our latest projects. Please come back often to take a peek at our wonderful adventures! 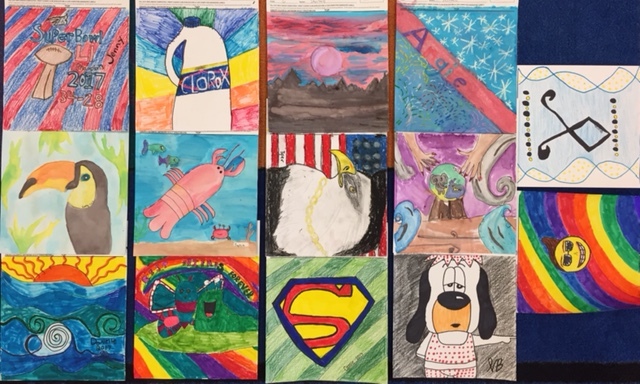 Grade 6 Square 1 Art Fundraiser! Dennett grade 5 students viewed and discussed the woodblock print Under the Great Wave Off Kanagawa by the Japanese artist Hokusai. We focused on the energy of the white foam, the boats almost hidden within the surf, the small appearance of Mt. Fuji in the background (perspective) and the curved stripes which help to show the dynamic movement of the water. 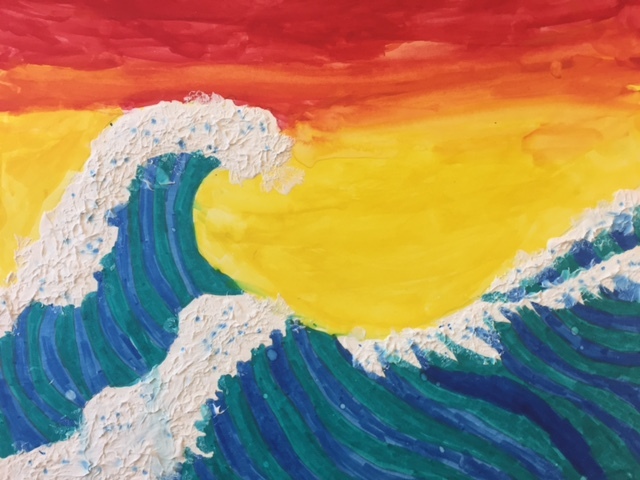 Students were inspired to make their own waves like Hokusai using several mediums. 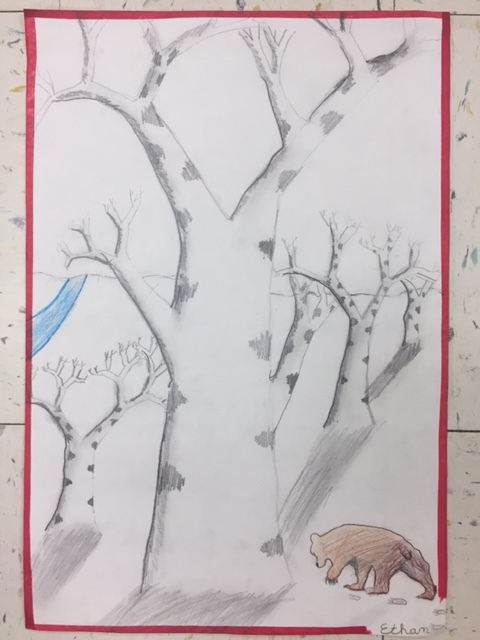 Dennett Grade 4 students viewed and discussed the art work seen in the illustrated version of Stopping by Woods on a Snowy Evening. We used art drawing pencils to create a value scale and practice different shading techniques, then created a forest of winter trees inspired by Susan Jeffers’ work that depicted perspective, shading with a variety of techniques, time of day and focal points. 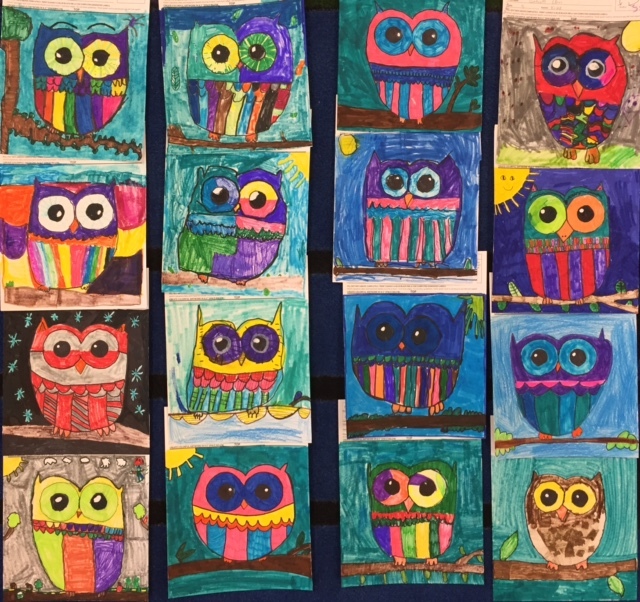 Grade 3 students participated in Square 1 Art! 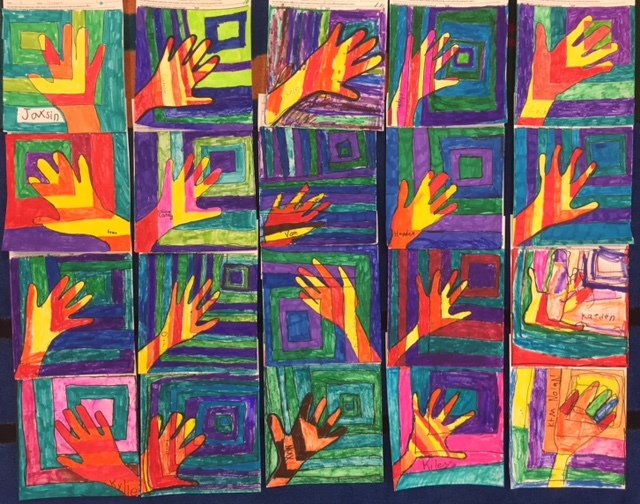 Dennett Grade 2 students created contrast color hand designs for Square 1 Art focusing on shapes, warm/cool colors and patterns. What’s your favorite kind of pizza? 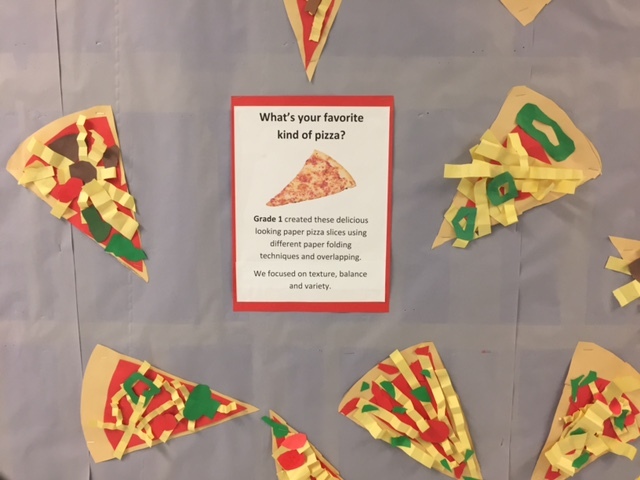 Grade 1 created these delicious looking paper pizza slices using different paper folding techniques and overlapping. We focused on texture, balance and variety. 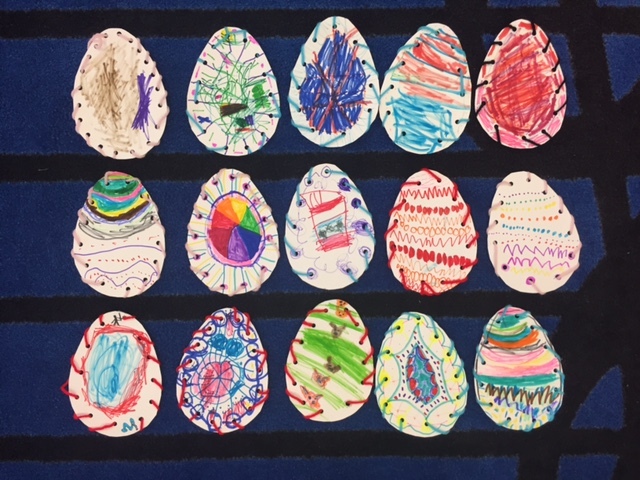 Dennett Kindergarten students exercised their fine motor skills while practicing patterns as we created these adorable paper sewn eggs. Kindergarten students talked about ladybugs and how they aren't really bugs at all, they're beetles! A ladybug’s bright colors warn predators to stay away. 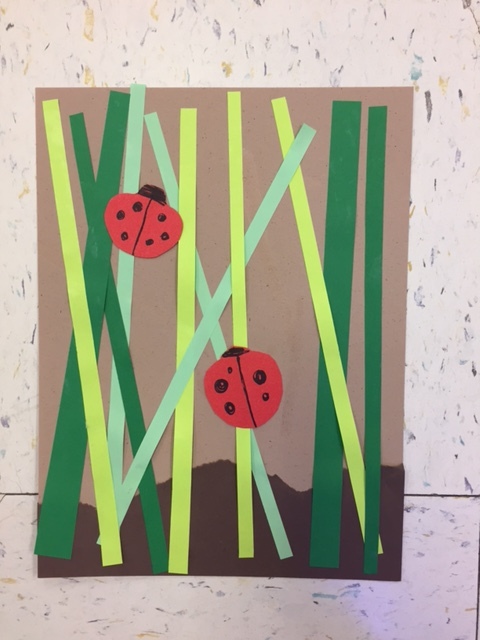 To celebrate spring, we used overlapping and symmetry techniques to create our own lady bugs in the grass.